It’s time for some good old forum action. From the Forums is a great way to see what all of the current hot topics are on the TiPb forums. In order to create any new threads of your own or reply to any of the existing threads, you must be a registered member. Becoming a member is a simple process that will only take a few minutes out of your day, so if you have not already already done so, head on over and register now. Our good friend from PreCentral.net, Dieter, needs your help. He's been stuck using the Palm Pre for so long he's forgotten all about his iPhone. Help answer some of his questions in this thread here! We've heard some rumblings of iPhone 3.1.3, so it made us wonder what Apple may have up their sleeves for us but an even bigger question is when will 3.1.3 actually be released? How many of you have left your iPhone to go to another platform just to eventually go running back to your lonely iPhone? Come on, we know you are out there... This is the thread for you. Jailbreaking is always a popular topic and lately it's been on fire. 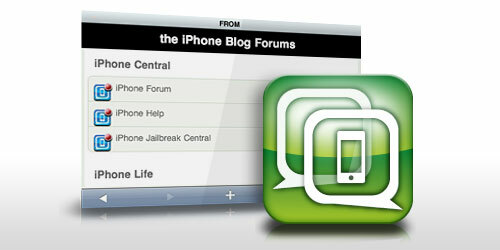 That being said, be sure to visit our iPhone Jailbreak and Unlock forum for some great conversation.